or any other parameters, we will take it back! To decide whether or not to keep your order, you will have 21 days (7 days for DENAS devices). For returns, keep the item in good saleable condition and keep all packaging (for example, inner cellophane packaging, protective membrane, etc.). Please do not use the item until you have decided that you want to keep it. Returns of non-defective items are possible only for product categories that come with protective packaging elements, and then only if they are not tampered with. 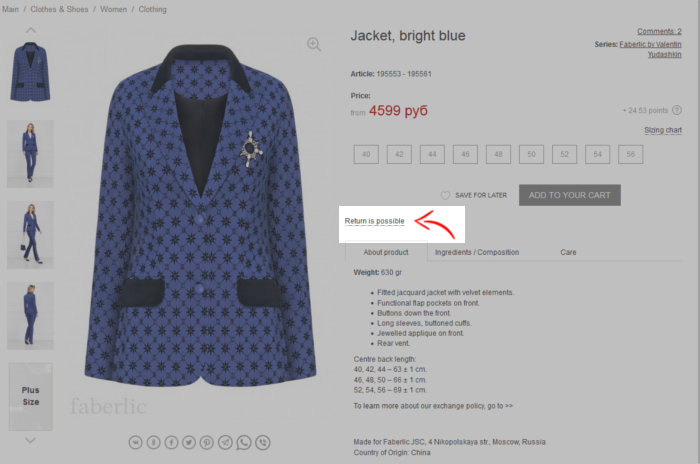 Such items are marked on www.faberlic.com with the special icon "Return is possible". If it is not an intentional part of the design, returns are possible for other defects within 30 days of when you receive the item. Please note! If a defect appears due to improperly trying on items, this is not a valid reason for return. Returns are possible only through the CP at which the item was received. Create a claim at the Collection point and give the reason for the return. Returns are carried out through the Russian Post. Print and fill out the return form, indicating the order number, item number, quantity, and reason for return. Place the return form and any other documents (if necessary) confirming your requirements into a postal container (box, etc.) with the item and send it through the Russian Post to the address: 140961, ASC, Box 151 (for JSC Faberlic). Additional sending and item exchange is not carried out. Please note! Payment of postal fees (Russian Post services) is made by the buyer when returning a non-defective item. When returning a defective or incorrect item, the company will compensate you for postal fees. Please keep your receipt for payment of postal fees and inform us of them on the website www.faberlic.com , in a feedback request in the section "3.2 Questions and claims related to address delivery". When processing a return at a Faberlic Collection point, funds are credited back to the personal account from which original payment for the item was made* within 10 minutes from creation of the Claim document. * If the returned item was purchased on a promotion and has a different price in the order (for example, you get one with a coupon and a second at normal price), then the funds are returned according to the lowest price in the order. If you are returning through the Russian Post, funds will be credited back as soon as the parcel arrives at the warehouse. When necessary, you can return funds from your personal account to your bank account. To do this, leave a request in the "Feedback" section in your personal account (1.2 Financial issues), and submit a claim. when returning underwear and swimsuits, be sure that the protective hygenic film on bottoms has not been removed. Do not remove the protective film until you are sure that you will keep the item. Returns and exchanges are not possible if the protective film has been removed!